After our excellent flight in Thai’s Royal Silk, my father and I were eager to see how United’s Polaris First compared. We weren’t entirely sure what to expect when we were boarding; United has been rather transparent about its plans to ditch first class. The new, super-business Polaris is the future, and at the time of our flight, United was (and still is) awkwardly juggling the various premium cabins it has across its fleet. Would Polaris First be a comfortable way to travel, or would it be a forgotten flop of a product? Turns out we were in for a pleasant surprise, and our final flight to complete the Southeast Asian Summer Vacation trip was both a winner and an incredible value at only 80,000 MileagePlus miles… but it wasn’t without some glaring indications of the end of United’s first class. Be sure to enjoy it while you can! …so I’m skipping a full review of it. Just know that this particular lounge is a member of the Priority Pass Network. That association alone can tell you all that you need to know about the quality of it. Like many of its counterparts elsewhere, it’s not a bad place to wait for a flight — it’s better than just hanging out in the terminal — and the food offerings are fairly tasty too (albeit lackluster). It is, however, a long way in quality from the Royal First Lounge in Bangkok. The other thing worth noting: Beijing Capital is massive. While it’s architecturally impressive, actually navigating it is a pain. We never left Terminal 3, but walking from our incoming flight to the lounge to the departure gate took nearly half an hour. Add in the fact that we had to clear customs and immigration (yes, even if merely transiting the airport) and then security twice before boarding, and, well, we didn’t have a lot of down time in the end. Perhaps a shorter-than-expected layover was for the best though; we had a plane to catch! The boarding process was thankfully smooth, except we had our water bottles confiscated by security guards who were screening all passengers on the jetway. That sucked, although we shouldn’t have been surprised: this is standard procedure for U.S.-bound flights departing China. Don’t make the same mistake we did. All first class passengers are invited to board via a separate jetway, so we did that after clearing the unexpected security checkpoint. We proceeded to turn right after passing through the forward cabin door, and then continued to our seats in the second row. 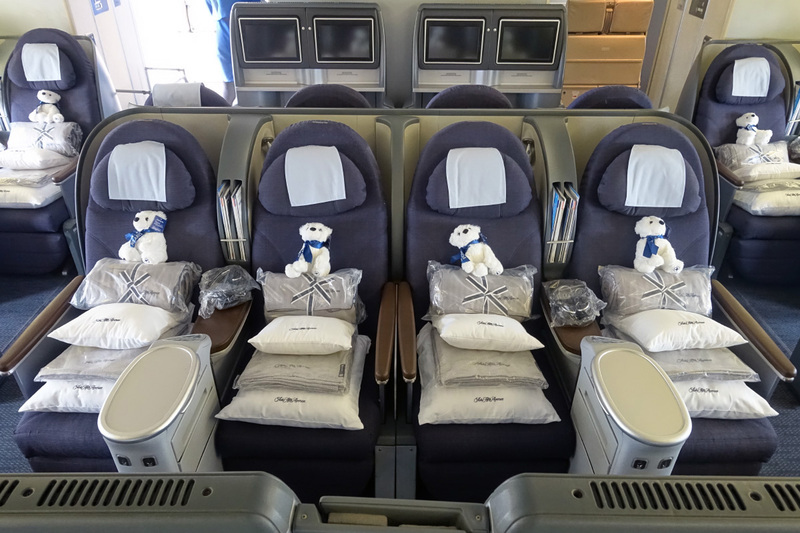 On its 777s, United has eight first class seats spread over two rows in a 1-2-1 configuration. At first glance, the cabin is really open, and no one would fault you if you initially mistook it for business class. The seats sorta resemble the herringbones found in the fleets of Virgin Atlantic, Air New Zealand, and Delta. Nothing here screams “premium!” Visibly tired and dated seats (that are nearly identical to the notorious dorm-style seats in business), an abundance of hard plastic surfaces, and a color scheme comprising of varying shades of gray do not lend themselves to crafting an image of luxury. If it’s possible to have a utilitarian first class hard product, United proudly features it. There’s also not a lot of privacy either. There’s no partition separating the two middle suites, and the headrests are only a few inches apart from each other. Furthermore, you can see your travel companions opposite the aisle without a problem. If feeling exposed prevents you from sleeping well, you’ll likely hate this configuration. However, while the form is far from inspiring, the seat performs surprisingly well when it comes to function. There is a lot that United quietly excels at, and while some/many of these features aren’t the most glamorous (not a lot of people are getting hyped about deep in-seat storage wells), some of the strongest offerings in the world don’t have them. As cliche as it may be to write, it’s little things that really make a difference in elevating this product to a higher standard. While visually unappealing, the seat is otherwise smartly designed. Its controls, for one, are uncomplicated but still offer a good degree of customization and support. You don’t have to reach very far to make adjustments either; the buttons are right next to the armrest. The entertainment system remote is a little bit further past that, and can be ejected if you prefer to hold it/use it without stretching. USB, Ethernet (?!? ), and headphone jacks are opposite the seat controls, closer to the passenger. A universal electrical outlet is at the very end of the panel. The complete set-up was configured with simplicity and ergonomics in mind, which is far too frequently overlooked on flashier airlines. Go figure: practical drabness is an asset for United’s first class! …And a lower console that’s most surprising size-wise. The interior of it is hollowed out completely, and it’s wide and deep enough to fit a standard personal item. It was particularly convenient to have my backpack right by my side for the entirety of my flight. I never had to stand to access the overhead bins, and from gate to gate, everything important was within an arm’s reach. The amenity kit… but wait a minute, something isn’t right here! Lots of improvements to the soft product! And even more things you can get, provided that you ask for them in advance! That’s not to say that the amenity kit is bad — it’s stocked with high quality Cowshed products and it has potential for future use on subsequent trips — but it seems inappropriate to be giving top tier passengers stuff from the lower class of service. At the minimum, it just seems like a cheap move. At least the stuff in here is both plentiful and practical for a long flight! …And I was eager to have the ravioli for dinner, and then a frittata right before we landed in Washington. Those both looked the most appealing, and the college student in me was hankering for some of the instant noodles too in the middle of the flight! Clay, the flight attendant working my aisle, took my order right after I settled in to the seat, and then brought over a mini-bottle of champagne and a glass of water to help welcome me aboard. It was a nice gesture to start the service, although I do wish there was actual, proper glassware. But then again, that’s only a small component of the experience, and is ultimately no big deal. The far more glaring issue is that the menus were no different than what was offered in business class! I get that Polaris First is being phased out, but it strikes me as premature to forget about it entirely. Given the glacier pace at which United is moving to update its planes with the new hard product, first class will continue to exist for at least three more years. There should still be some product differentiation beyond just a more spacious hard product in the meantime. That doesn’t appear to be in the cards though, so passengers in Polaris First should lower their expectations accordingly. …And then by bringing a fully stocked wine cart through the cabin and serving a “cocktail snack” comprising of a mozzarella cheese ball, a cherry tomato, and an olive on skewer, and some nuts. Seeing that this was our first Polaris flight, naturally we had to celebrate with flights! I chose the white wine, and my dad opted for red. The cocktail snacks were simple yet tasty. The ingredients were fresh and the nuts were warm, and at 38,000 feet, both of those are welcomed luxuries. It was cool being able to sample the various white wines too, although for my meal, I opted for a glass of red. It’s not that the whites were low quality and bad, they just weren’t to my taste. Quite some time passed between the wine flight/the introductory snacks and the actual appetizer for the meal, but that’s okay. It gave me more time to enjoy the drinks and work up an appetite for the food. The first dish — a crab salad with cucumbers, capers, and a prawn — was especially good, and served chilled with some additional selections from the bread basket. The garlic bread was some of the best I’ve had on a plane — it nearly melted in my mouth! Ah! It was such good garlic bread! Also, the salt and pepper shakers were cute too. They’re certainly appropriate for the brand! After some more time — maybe 20 minutes or so — the appetizer was followed by asparagus green pea soup, which was warm and creamy and flavored to perfection. Nothing was too overbearing, nor was the texture gross. There’s nothing worse than watered down soup… United thankfully “gets” that. The pace of the meal service, by this point, began to speed up. As I was finishing up the last drops of the soup, Clay came to each suite with a trolley carrying various salad ingredients. This particular presentation style, which encourages diners to customize their salads as they like them, is another one of the changes inspired by the new Polaris product. I must say, as someone who loves his greens, this was my favorite part of the meal. It’s frustrating when other airlines skimp on their salad choices, which is forgivable when flying business, but there’s no excuse in international first class. Kudos here to United. By this point in the service, we were about two and a half hours in to the flight, which meant that the meal was moving at a leisurely pace, but it wasn’t excruciatingly slow either. Seeing that there was still 11 hours yet to go still, I didn’t mind at all. What else is there to do that long anyway? The table was completely cleared a few moments after finishing the ravioli, and then I sipped my wine while watching the moving map. Some more time passed, and once everyone had finished eating and drinking, Clay reappeared to reset the tables and then offer a selection of cheeses from a cart. He also presented a small glass of port to those who were so inclined. Needless to say, it was all so delicious. Once that was all done, I unwrapped the mattress pad and reclined my seat for a little bit. As an armchair, United’s hard product excels. It’s well-padded and supportive, but not without being too firm. My bones weren’t aching in flight, nor did I ever feel like a potato; it was the perfect balance. When it came time to go to the bathroom, I dreaded getting up and leaving my cozy spot for a few moments, but at least it gave me an opportunity to ask for turndown service. In the meantime, I learned that the bathroom at the front of the Polaris First cabin is nothing special. It’s shared by the crew and passengers, and it wasn’t kept particularly clean on my flight. That said, aside from a very full waste bin, nothing was disgustingly gross about it either. Like the rest of the hard product, the lavatory was drab and utilitarian. I wish I could say I did something compelling — perhaps sample the “instant noodle soup” — for the remaining ten hours of the flight, but alas, I did not. The bed is even more comfortable than it looks. With so many pillows to choose from, a mattress pad, and a puffy duvet, it’s easy to sleep the whole flight away…and that’s exactly what I proceeded to do. I wasn’t particularly tired, but I was out like a rock for nine hours, A.K.A. a whole night’s worth! Seriously, when I closed my eyes, we were over Russia. Clay woke me up for breakfast just a hundred miles out. The sleep felt incredible — I seldom sleep that long on terra firma, let alone at 38,000 feet — and that’s a reflection on how excellent the new Polaris bedding is. This is one of the best features of United’s first class, and there aren’t very many airlines that can match this product when it comes to resting. Within 90 seconds of waking up, there were plates of food in my face. I wolfed everything that I could down — the frittata, mushrooms, potatoes, and sausage went faster than the not-so-fresh fruit — and that’s when the purser whisked my tray away. I didn’t have time for the croissant or yogurt, but that’s okay, because two minutes later, we landed smoothly at Dulles. I don’t think I’ve ever had a meal so close to arrival! Either way, I was happy to be stateside after my Southeast Asian summer vacation, and this United flight experience was the perfect exclamation point to an incredible couple of weeks. We had a quick taxi to the gate, my father and I said good bye to Clay and the rest of the crew, and we deplaned only 10 minutes after landing. It was time to go home. Good bye United Polaris First!! I wasn’t expecting to think of United’s Polaris First as highly as I do right now, but here we are. It’s a shame that the product is being phased out, because the aging-yet-underrated seat is especially comfortable, and it’s perfectly complemented by the soft product improvements introduced with the Polaris rebrand. I’ve never slept for nine hours on a plane before, but the Saks Fifth Avenue bedding is (hot take alert!) industry leading… for business class. And herein lies the inherent flaw with Polaris First: now more than ever, it just seems like a really, really nice business class. The nearly identical menus and amenity kits certainly don’t help with this image. But then again, at 80,000 MileagePlus miles, this is one of the cheaper ways to travel in first class between (Southeast) Asia and North America. There’s no denying that this is a great value for a good product, and it’s something I wouldn’t hesitate to fly again. Redeeming points for this product, especially in the few days leading up to your departure, can be a great value. 80k MileagePlus miles were a steal on this route! The seat is a lot more comfortable than it looks. There’s plenty of space to move around, it’s well-padded, and there’s ample storage for everything short of a carry-on roller. The bedding is one of the nicest offerings in the sky, with an abundance of pillows and blankets available to passengers. …I’m not entirely sure that the dining options are that much better than what’s served in business class. The menus are nearly identical, but then again, United is in the process of phasing out its first class offering. The seat looks like nothing more than an extra spacious herringbone seat in business class… but with no privacy either. The cabin is *very* open. It seems a bit premature to stop making first class amenity kits so soon… the business class branded package cheapened the experience. United First is to business class as premium economy is to regular economy. This analogy suggests that United First is just a small step above regular business class, and that comparison becomes evident when comparing this product to the likes of Air France, Etihad, and Cathay Pacific. Have you flown United Polaris First before? What are your thoughts?